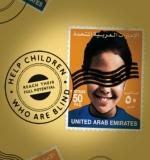 Stamps | Save stamps for charity - U.A.E. If you celebrate Christmas, you might be receiving a bit more post than usual right now. I find it really exciting to open the PO box and see more than just the usual bills. This year’s Royal Mail stamps from the UK are really beautiful. Don’t forget to snip them off the envelope and send them to me to help the RNIB. They can be recycled, raising funds to help people who are visually impaired. Thank you to everyone who keeps sending them. 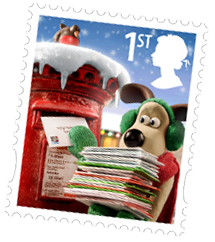 Whatever you are doing this December, hope it’s happy, healthy and please….save your stamps. This morning I opened 7 days over my morning porridge and was incensed by the headline about a passenger who is blind who was refused a place on a flight from Dubai unless he was accompanied by a sighted guide. As a person with full sight I take the freedom to travel without too much inconvenience for granted but I know from talking to friends who are visually impaired that this is not the case for them. Ignorance and prejudice often rear their head especially with air travel. One bug bear for instance is being encouraged to get into a wheel-chair; ‘It’s my eyes that don’t work, not my legs’ quipped one of my fed-up friends to an over insistent member of the ground-staff. All travellers, whether sighted or visually impaired, want to be treated the same. I hope this is a wake up call for this airline and they train their staff and change their practises to consider the person first, not their disability. 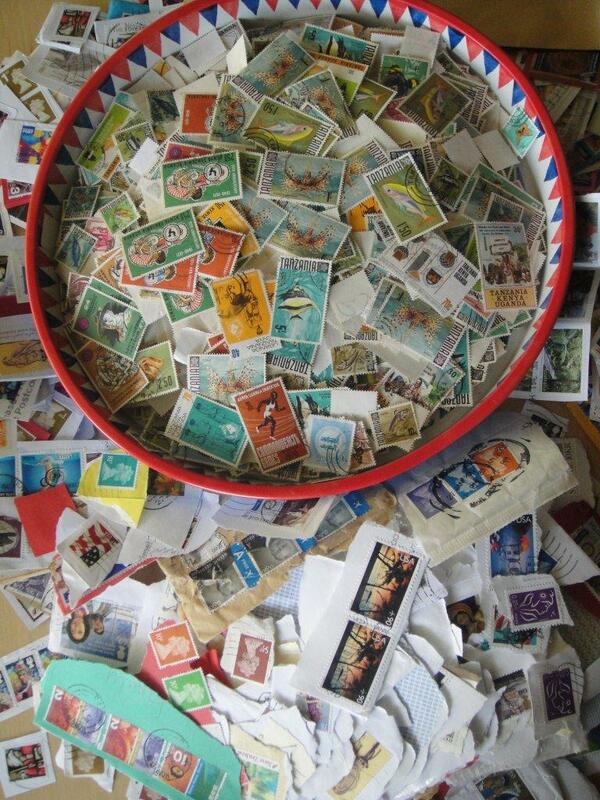 I’ve got a huge pile of stamps to send off. Thank you for everyone who continues to support this cause and takes the time to keep their used stamps and send them to me. Keep saving them – every single one makes a difference. A rare 160 year old stamp is to go on display in London. 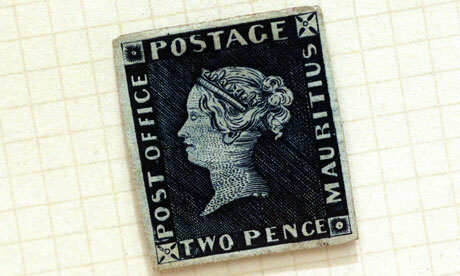 Only 500 Mauritian 2d stamps were produced and it is thought that only 12 survive. Goodness know how much it’s worth. I can tell you, however, what your stamps are worth to the RNIB. They raise much needed funds to help people who are blind and visually impaired. Please keep collecting. Thanks to The National for featuring the stamps collection. I was expecting the publicity to knock me out on wave of stamps when I opened my PO Box this week – unfortunately they didn’t print the website details or where to send stamps! Please help spread the word (via Facebook or sending your friends this link) and please keep sending your stamps so we can help the RNIB reach their target. And if you’ve visited this site prompted by the article – thanks for your tenacity and perseverance! People in the UK and around the world are still losing their sight unnecessarily. RNIB campaign to eliminate avoidable sight loss and support research into the causes and latest treatments of eye conditions. We can raise much needed funds for the RNIB just by collecting stamps. We can raise money from both British and overseas stamps. It doesn’t matter if they have already been used. 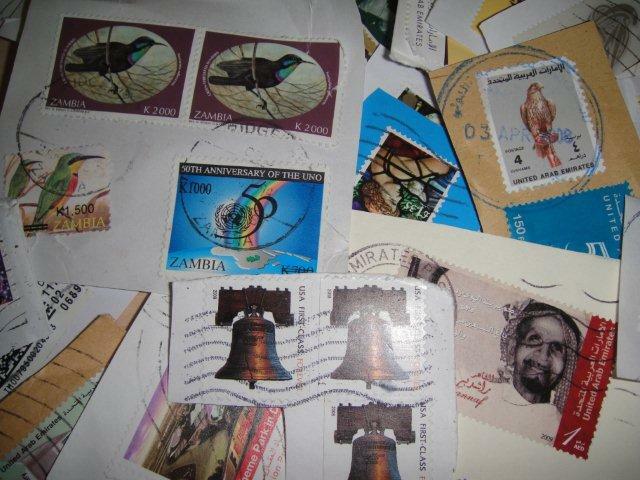 More money can be raised from overseas stamps. We also collect first day covers, presentation packs and albums. 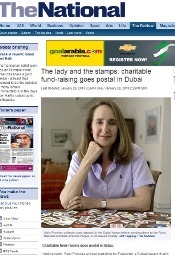 By post to: Sally Prosser, Save stamps for charity, PO Box 75959, Dubai, U.A.E. Or contact me via sending me a message using the form in the “About” section for info on where you can deliver them to in Dubai. TNT will then send them to the RNIB stamps collection centre – they have generously donated this service free of charge.